Today I am going to post the code of a function I wrote to check broken links in a web page. First, how to check broken links (I know that’s obvious :D). To check broken links, my code navigates to the link given, and checks whether user lands up in the same page as expected. While checking links on a page, I also find some links that, when clicked, open a page in a separate window. Most common example of such links are the links to social media sites on a page. Eg. 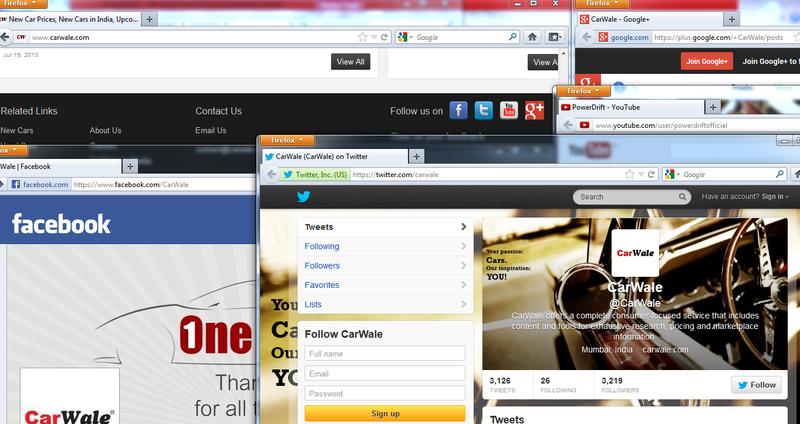 In the below code, I am testing the home page of “http://www.carwale.com/“. This page has 4 links – the icons at the bottom of the page for facebook, youtube, google plus, and twitter – that when clicked, open the respective pages in a new window. Here, the section that handles multiple windows will come into play. If there are any broken links in the URL you passed to the function, they will be printed out in a list at the end of program execution. def_elements.home_page isn’t defined and I’m not sure what to use. Oops! I am so sorry for confusing you. def_elements is a module i created and imported in my original script, and forgot to remove in the script here. The module contains my global variables. I have updated the script in my post to define home_page in the current script now. You have to assign your site’s default page to the home_page variable, and it will work properly.